The blanket of snow on the lakes and surrounding mountains had just begun to melt when one sunny morning of May we landed at the Calgary airport after a two and a half hour flight from Toronto. Our destination was the Canadian Rockies – one of the most beautiful places in Canada. The Rockies are thickly forested as well as snow-bound mountains across central Canada from Banff to Jasper and beyond, through which pass the transcontinental railways of Canada. A wonderful highway winds its way through some of the most enchanting nature spots in the world. Our friend Robin was at the airport to receive us. The plan was to spend a couple of hours with Robin and Dolly and their two lovely daughters and then to proceed to Banff, the gateway to the Rockies. We picked up a car from Hertz and proceeded to Robin’s place. It was a great re-union with Robin and Dolly after our days together in Uganda – another beautiful country about which I might write on another occasion. Over lunch Robin gave me all the necessary directions about the road to Banff. After tea, we left Calgary for Banff – a distance of 128 km via Highway 1 or the Trans Canada Highway. In about an hour we passed the gate of the Banff National Park where we paid the entry fees and soon reached the Inns of Banff Hotel where we had booked our accommodation. What a beautiful little town Banff is! Surrounded by forested mountains with their peaks still covered with snow, the town of a little over eight thousand people has all modern amenities – albeit on a small scale. It even has a nice little mall with a great food court. There still was enough daylight for an exploratory walk around the place where we would stay for three nights. The gas station with its small provision store came in handy. We had planned to keep the next day for Banff itself and to explore Lake Louise, a scenic spot some 60 km away. After a late breakfast we started for Lake Louise. A cloudy sky and light drizzle did not make it very promising. We took the Bow Valley Park Drive, winding through thick forests and some great scenic spots. The quiet road has a voluntary restriction from March to June – no traffic between 6 pm and 9 am – so that the wildlife is not disturbed. It was cold and damp at Lake Louise; still there were tourists around. The lake was frozen. A small hut on the edge was half covered with snow. We wondered what the place would be like in peak winter! On the way back, we once again drove through the Bow Valley Park drive hoping to see some wildlife. It was a little late in the afternoon. Sunset was still a long time to come. On this secluded forest road, however, there was just enough light to drive without the headlamp on. There was no sound, except the drone of our car’s engine; no other car was there on the road. We drove very slowly, surveying almost every inch of the bushes on both sides. And then we saw them as we took a sharp turn. A pair of young moose were grazing on the grassy shoulder of the road. They would have felt our presence, but were not too bothered. We stopped the engine and watched them for a long time. The tourist pamphlet spoke of a variety of wildlife in the Banff National Park. Here was our first glimpse of some! Back to Banff, and with some daylight still available we drove around the township and drove up to the top of the Sulphur Mountain – so called because of the hot spring there, which smells of sulphur. It a gave a wonderful bird’s eye view of Banff. On the next day right at dawn, we hit the road. The drive to and from Jasper would be over 600 km. Our aim was to reach Jasper by noon, stopping on the way at the scenic spots mentioned in the guidebook and return the same evening. The main attraction was the drive itself –a spectacular highway passing through remote, high-altitude terrain and the famous Columbia Ice Field. In its course this highway reaches the highest elevation of any other road in Canada. The Transcontinental Railway line gave us company for some time before vanishing into the lush green woods on its way to Vancouver. We soon came to the only functioning Service Area on the ice field highway at this time of the year. We decided to stop there for a while and eat our breakfast. As we pulled into the parking lot, some tourist buses also came in. We hadn’t seen much traffic on the road; so human presence was very welcome. Hal an hour later we were again on the road. The highway was now passing through an avalanche prone area, and the mountains, which had so far looked far away, drew nearer. As we negotiated a turn where a snow-layered mountain had sloped right down to the road, we caught the glimpse of a couple of big-horn mountain sheep grazing on a little green patch between the road and the mountain. They had vanished even before we thought of taking a close view. As we drove at a leisurely 100 km per hour, the sun rose. We had to put on our goggles to protect our eyes from its dazzling reflection on the snow on the mountains on both sides. Every turn of the highway presented unbelievably beautiful sceneries, with snow-capped mountains and green forests as the backdrop and vast stretches of frozen lakes making the foreground. The azure sky, crisp, cool air and the quietude made the place appear to be out of this world. We suddenly found ourselves almost surrounded by miles after miles of snow and icy gradients rising away from the road. This was part of the famous Athabasca Glacier’s forefield trail. There was a glacier centre with parking space and a few large buses with huge tyres – obviously for taking tourists up the slopes to have a view of the glacier. However, there was no one around. The information plaque said the trail “passes through an area that, less than 100 years ago, lay beneath the glacial ice”. A couple of steps on the few solid rocks were all that we ventured in this desolate and cold desert, before moving on toward Jasper. Our next stop was the Athabasca Falls just 30 km before we reached Jasper. The number of vehicles on the road as well as that of tourists was increasing. A short walk down the slope, and the gurgling of the water guided us to the fall. It was yet to acquire its full force as the snow had not fully melted yet, but the shadowy gorge through which the water rushed and the surrounding woods with the chirping of birds from their hideouts added to the beauty of this lovely spot. Jasper is an important railway station on the railroad to Vancouver. It is a small, picturesque town with a population of just over four thousand. 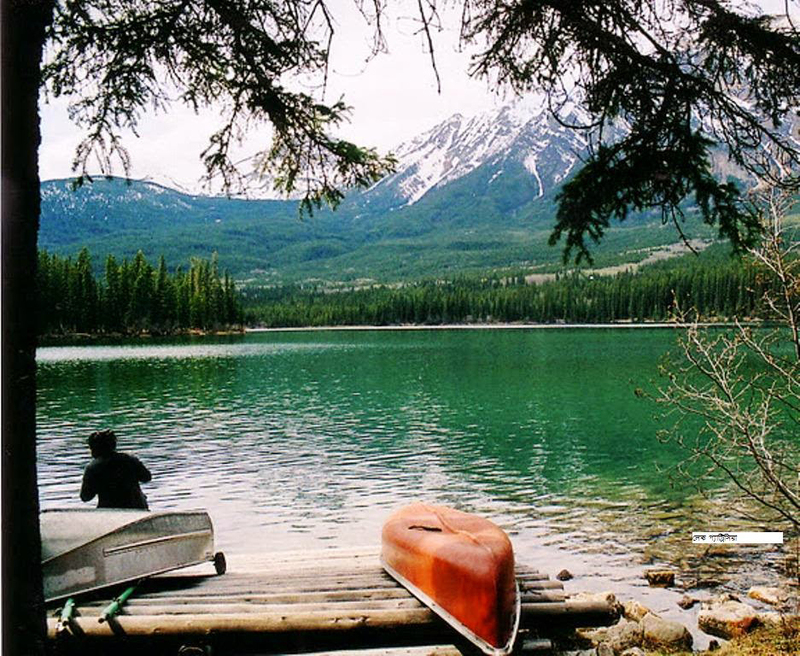 It also is the centre of the famous Jasper National Park spread over an area of 10,878 sq. km. Hungry and somewhat tired, we found a quaint little family restaurant alongside a gas station. Over the lunch we went through the little booklet on Jasper and decided to visit the Whistlers to take a ride to the top by “tram” [ropeway] and to spend some time at the lakes Patricia and Pyramid. Our target was to leave Jasper latest by 4 P.M. so that we could be back to Banff before it was too dark. The journey by Sky Tram to the upper station at an altitude of 2277 metres was a great experience. The summit is just a few metres from the upper station, but the warning signboards – that stepping beyond the walkways is at one’s own risk – hold back the more inquisitive ones. Even though the sun was shining bright, it was bitterly cold up there and the wind was piercing through our layers of warm clothing. Far below the town of Jasper basked in the afternoon sun. Snow peaks far and near dazzling in the bright sun against a clear sky made a surreal landscape. The last spots in Jasper to be seen were the lakes Patricia and Pyramid. Both were picture perfect with their waters reflecting the verdant greenery at the foothills of the snow-capped peaks that stood surrounding these beautiful lakes where the angels would be coming down on moon-lit nights! After a short break on the bank of Patricia, we began our journey back to Banff. On the return drive we did not stop anywhere. Though I drove a bit faster than in the morning, we kept a watchful eye on the road for any animal that might come to sight. We were indeed lucky. After driving almost 150 km from Jasper, we saw a small group of bears – two cubs and their mother – in a thicket just away from the road. At the same time, we were amazed to see, on the opposite side and very close to to the road an adult bear of huge size eating something dug out from the ground. We immediately pulled over to the shoulder and switched on the car’s hazard lights to warn others behind us. Soon there was a long line of cars st behind us. It was quite exciting to watch the bears. But I had to be satisfied with whatever shots were possible from that distance, since stepping out of the car would be dangerous, and was strictly forbidden. After a long while the bears slowly moved deeper into the woods and we continued on our journey. As we reached the extremities of Banff, the sun was covering the snow peaks with molten gold and painting the sky into a shade of magenta that only nature’s pallete can produce. We were quite tired after nearly six hours’ drive, but were satisfied beyond any measure with a truly unforgettable trip.